Kindergarten, originally uploaded by [Zakkaliciousness]. 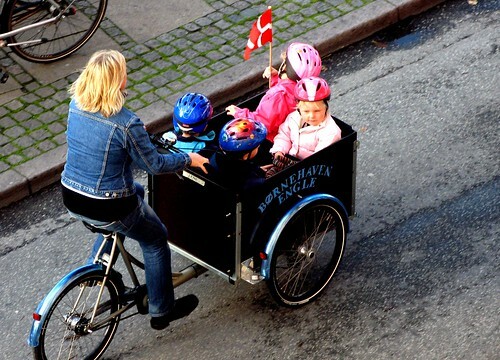 One of the many brands of Danish-made cargo bikes in use in Copenhagen. A Christiania bike, this one owned by a kindergarten and used to ride the kids around to visit museums, theatre or parks and playgrounds while their parents are at work. There was another child care worker on an identical Christiania bike five metres behind this one. I read so much about a Dutch company - Bakfiets - on American bike blogs. Merely because they recently started a comprehensive export to that country. It makes me smile, knowing how many dozens of cargo bike brands there are in Northern Europe, and the American market think that Bakfiets (which is probably a decent brand) are the only ones in existence. Here are some other brands of cargo bikes that we have posted about previously. And yes, Nihola deliver worldwide.